A fire broke out above Putnam's Pub & Cooker at 419 Myrtle Ave. just before 11 a.m. on Tuesday, according to fire officials. CLINTON HILL — A fire broke out Tuesday morning above the popular Myrtle Avenue restaurant Putnam's Pub & Cooker, damaging the eatery and leaving a firefighter with minor injuries, officials said. The blaze started just before 11 a.m. between the first and second stories of the four-floor building at 419 Myrtle Ave., according to the FDNY. More than 100 firefighters and paramedics responded to the scene and brought the blaze under control by 12:17 p.m., officials said. One firefighter suffered minor injuries, but the nature of them was unclear, according to FDNY officials at the scene. Officials did not say whether tenants of the building's 12 residential units would be displaced. 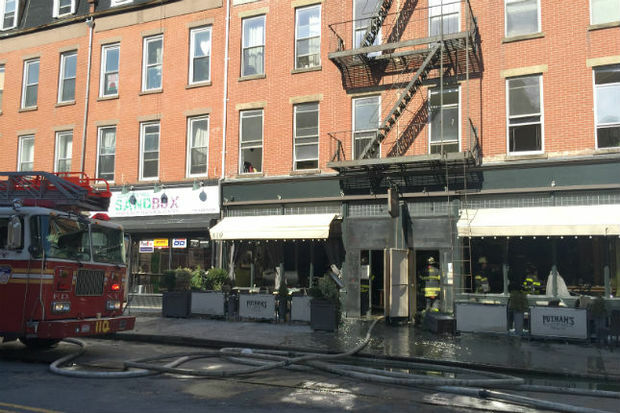 The fire left the first-floor restaurant's windows shattered and water streaming out into the street. The restaurant's ceiling also showed signs of damage. A man identifying himself as the owner of Putnam's declined to comment at the scene, as did tenants of the affected building. Neighbors, many of whom heard of the fire through word of mouth, gathered across the street as firefighters worked to put out the flames. “They’re very nice, they have nice food in there,” said Mellonie Kirby, a Clinton Hill resident for more than 40 years, whose Valentine's Day dinner plans at Putnam's were dashed by the fire. Alex Papp, 43, a singer-songwriter who used to perform at the restaurant's open-mic nights, said that while Putnam's has only been around for a few years, its tight-knit community made it feel like it had been around for 20 years. “It’s one of my favorite bars ever — it’s a really homey, community-oriented place,” Papp said. “It’s just sad, really sad."